The PHA-EH and PHS-11 series has been discontinued. Please contact our Flow and Level Engineering department for possible alternative. 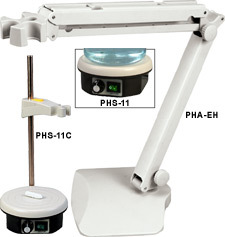 The PHS-11 Series of magnetic stirrers operate by generating a rotating electromagnetic field in the stirring heads. The liquid to be stirred has a magnetized stirring bar placed in it. The bar and liquid is rotated by the magnetic field produced in the heads. The PHS-11C also includes an electrode holder for hands-free measurements. The PHA-EH is an electrode holder only for applications where stirring is not desired. It has a weighted base for stability and locking knobs to hold the desired position. 참고: Comes complete with stirrers, power supply and operator’s manual.